I'm still having fun with the slow cooker. I had some drumsticks that I got for .39 cts./lb. at Treasure Island, and a pound package of mini carrots (also on sale) that needed to be cooked pronto. I'd been reading a lot online about cooking drumsticks in the slow cooker so I thought this would be a good time to test it out. 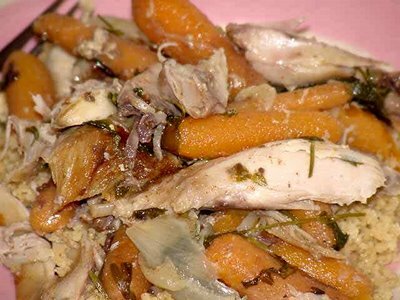 If you don't like really well-cooked vegetables, the slow cooker probably isn't for you. While I'm all for al dente, crispier fare, soft, almost mushy vegetables are like comfort food to me. Maybe because that's what I grew up with. This was delicious. The chicken was silky-smooth tender. I used a lot of smoked sweet Spanish paprika and the flavor worked its way through to the bone. Whole wheat couscous made an excellent accompaniment. Chicken breasts wouldn't work in this recipe--the slow cooker tends to dry them out too much. Layer onions and carrots in the bottom of the cooker. Pour in the broth. Season with salt, pepper, and garlic powder. Lay the drumsticks on top of the vegetables and sprinkle the paprika over them, then some more salt, pepper and garlic powder. Cook in slow cooker for approximately 5-6 hours, or on high 3-4 hours. About an hour before they're done, add the parsley. The chicken should fall off the bone. Take the chicken out of the pot, take out the bones and separate the meat into bite-size pieces, then place back in the cooker with the vegetables. Using the stock for liquid, prepare whole wheat couscous according to the package directions. Serve the chicken and carrots over the couscous. Ok, that sounds delish. And, really, the one vegetable that I think are better overcooked are carrots.